Mayor Ken Livingstone has criticised a London Assembly member for running up a "staggering" £10,000 taxi bill. Brian Coleman, vice chair of London Assembly (LA), amassed the costs between April 2006 to March this year, audit figures revealed. Mr Coleman said the cars were hired by the LA and were used to attend only official functions and events during his tenure as chairman. The average taxi bill for an LA member was about £845, the report said. 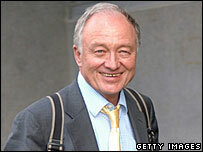 Mr Livingstone said: "Brian Coleman's cab bill is an example of extravagance for no purpose. "Brian Coleman has spent over £10,000 on his taxi bill, the highest by a long way of any individual since London government was re-established. "So rather than swanning around London in a chauffeur-driven car, Mr Coleman should try cutting down on the receptions, lunches and dinners and set an example to Londoners by using buses, the tube, or even walking occasionally." Mr Coleman, a Conservative member, said: "It is just not correct to refer to these as taxi bills. "These are costs for the cars hired as and when needed to attend official chairman's engagements. "I was in a ceremonial role... I attended 169 chairman's engagements." The relationship between the two politicians has long been strained. Earlier this year it was Mr Coleman who chaired the LA hearings which highlighted the cost of travel by the mayor and his senior staff, including trips to Cuba and Venezuela.